A celebration of the Seagulls’ promotion to the Premier League will take place with an open-top bus parade on Sunday (May 14). The Brighton and Hove Albion parade will begin at the Palace Pier end of Madeira Drive from 5pm, with a bus convoy carrying Albion’s players, staff and directors, and Brighton and Hove city councillors to Hove Lawns. The convoy is expected to arrive at Hove Lawns around 6.30pm. As the parade makes its way along Brighton seafront, fans are advised to watch live coverage via two large TV screens either side of the stage at Hove Lawns for the best view. There will be three areas set up on Hove Lawns: Zone A, B and C.
The crowd at Hove Lawns will be kept entertained at Zone A via large screens, and parade coverage will begin at 5pm - with video coverage interspersed with live interviews. On arrival, at around 6.30pm, Albion’s players and coaching staff will arrive on-stage at Hove Lawns. The club has said fans choosing to remain at Hove Lawns and watch the parade on the screens ahead of the players’ arrival at Zone A are advised to arrive early, and be in position for 4pm, bring their own refreshments, and ensure they have adequate clothing and sun protection for changes in weather. It also said those entering Zone A at Hove Lawns will be restricted to four alcoholic drinks per adult, and no glass bottles or chairs will be permitted. Those wishing to sit throughout the event are advised to bring their own chairs and to use Zones B or C, which will have their own additional big screens. There will also be a disabled viewing area in Zone A. The club said while local traders will be operating as usual, there will be no additional refreshment kiosks in Zones A and B for the event. It added that bags would be searched on entry to Hove Lawns, and hand held pyro and/or flares are not permitted anywhere on site or on the route. The club warned any individuals found to be in possession will face arrest and a ban by the club. Road closures will be in place from 2pm, including the seafront Kingsway Road from Fourth Avenue to West Street. Grand Avenue will also be restricted to residents’ access only. There will be rolling road closures along the parade. 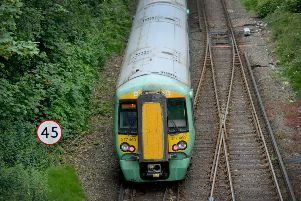 Fans are also advised to use public transport wherever possible, and those using the train are urged to arrive and depart from Brighton Station. Brighton and Hove Albion said those with no choice but to come by car should utilise car parking to the north of the city, or east and west of the road closures.